Melissa Biel has over 25 years experience in the nonprofit and healthcare fields. She is a co-founder of Community Benefit Connect. Melissa works extensively with a variety of nonprofit hospitals to create comprehensive community benefit program reviews, community health needs assessments and planning processes. She is the initiator and convener of a regional community benefit networking group that engages community benefit professionals from hospitals across three counties in Southern California. Melissa has supported the multi-hospital site national demonstration project, Advancing the State of the Art for Community Benefit (ASACB), as the Community Health Evaluation Specialist. In this role, she supported the evaluation and initiation of new approaches at the local and system level. Melissa’s experience spans from working as a member of the executive leadership team of a national nursing organization, writing grants for nonprofit organizations, conducting program evaluations for community-based initiatives, and managing programs for a regional consortium of community clinics. Melissa received a BS degree in Nursing from California State University, Long Beach, and MS degree in Nursing Administration from California State University, Los Angeles. Her doctorate is in Public Administration from the University of La Verne where her dissertation research focused on community benefit among nonprofit hospitals in California. Maya Dunne has over 20 years of experience in the health, non-profit and public sectors serving in leadership and formation roles. She is a co-founder of Community Benefit Connect, and currently supports efforts in community benefit and the non-profit sector. She is currently working on several projects to link urban agriculture, food systems, hospitals and communities to improve community health. Maya was the VP of Community Outreach for the St. Joseph Health System, where for ten years she supported 15 non-profit hospitals in the achievement of community benefit outcomes, community engagement and innovative practices with a focus on Healthy Community approaches. During this time, she served as the first chair of the Community Benefit Committee of the Catholic Health Association, and a system lead for the national demonstration project, Advancing the State of Art of Community Benefit (ASACB). Maya was the CEO/President of the St. Joseph Health System Foundation (SJHSF), where she initiated new grant strategies in health prevention, community leadership development, international funding, and health access. Under her leadership, $15 million in grants were distributed annually to non-profit organizations and clinics focused on underserved communities. She is a co-founder of the Orange County Health Funders Partnership, a collaborative of funders who work together to support regional approaches, including an innovative Diabetes Initiative. In the public sector area, she worked as a Policy Director at the City and County of Los Angeles, supporting new programs and legislative solutions to address community service needs. She has served as Executive Director, been an active part of governance boards, and co-founded several non-profit organizations. Maya completed her Master’s degree in Urban Planning from UCLA with a focus on Social Policy. She is currently adjunct faculty for the USC School of Social Work. Michael Villaire, Chief Executive Officer, joined the Institute for Healthcare Advancement (IHA) in 2000. 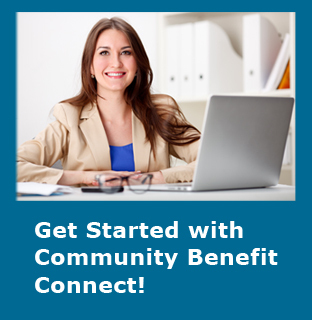 The Institute for Healthcare Advancement is the sponsor of Community Benefit Connect. He handles IHA’s daily operations and coordinates IHA’s health literacy activities. He plans and produces IHA’s rewrite/redesign service and yearly health literacy conference. Prior to working at IHA, Mr. Villaire served as managing editor for a number of peer-reviewed medical and nursing journals and produced national healthcare symposia. He earned baccalaureate degrees in English and Communications from Western Michigan University and a master’s degree in nonprofit organizational leadership and management from the University of La Verne.